Iam now very pleased with Empire Today. They have contacted me and my problem has been resolved to my satisfaction. They have made me a happy customer and recent service was great. Please never purchase anything from this horrible & dishonest company!! We are a young struggling couple that wanted nothing but the best for our floor renovation but instead got garbage. After taking consultant advice, which promised us "this was best floor that could withstand almost anything" we purchased "scratch-free" flooring. But not even after 24hours installation floor was chipped. After one-month borders started to break and it hasn't even been 1yr since we purchased and we have scratches, dents & chips everywhere. 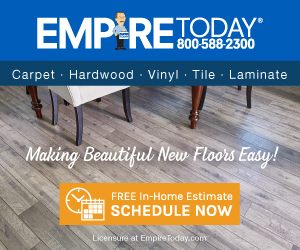 We take EXTREMLY good care of flooring because we own and want it to last but unfortunately even with specific instructions from company itself on how-to care for floors, it has been nothing but a disappointment. I've never move any furniture around & I even ask my guest to remove shoes and I STILL find new scratches! After several complaints, they sent an inspector, which "claimed" that we caused damage to floors. The experience with Empire Today has been nothing more but upsetting and waste of my money. Review #210303 is a subjective opinion of jari92.